‘The Mystery of Dragon Seal: Journey to China’ promises to be one of the most spectacular movies next year, and audiences will get a chance to see a fight between Jackie Chan and Arnold Schwarzenegger. 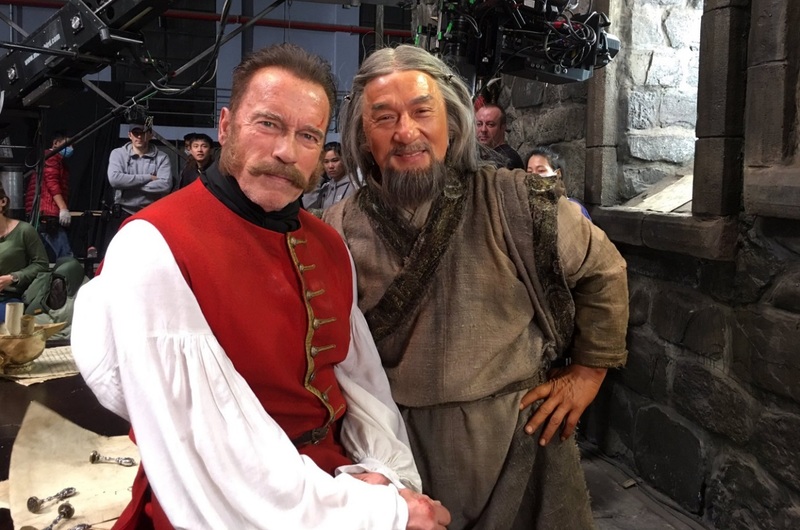 Filming of the first Sino-Russian blockbuster The Mystery of Dragon Seal: Journey to China starring Arnold Schwarzenegger and Jackie Chan has been wrapped up. Directed by Oleg Stepchenko, the film will be released during Chinese New Year in February 2018. So what we know about one of next year’s most anticipated movies? The movie is the sequel to 2014’s Viy, which was based on the famous novel by Nikolay Gogol. Viy tells the story of English traveler and cartographer Jonathan Green (played by Jason Flemyng), who in the early 18th century finds himself in a small village lost in the impassable woods of Western Ukraine. Here, Green is forced to face ancient demons including the terrifying and legendary Viy. In the new movie Green receives an order from Russian Emperor Peter the Great to map Russia’s Far East. His adventures lead him to China, where he’ll make a number of breathtaking discoveries, meet Chinese princesses, and face mythological creatures including the fearsome Dragon King. Aside from Flemyng, Schwarzenegger, and Chan, Rutger Hauer and Charles Dance also star. According to one of the movie’s producers - Alexey Petrukhin - Schwarzenegger plays one of the main characters. The former governor of California said that when the producers sent him the script, he said “Wow!” He instantly fell in love with his character and didn’t think twice about signing up. Schwarzenegger will play the Constable of London Tower, and he will stage a mixed marital arts fights among the prisoners - with the winner being granted his freedom. Petrukhin refused to reveal any plot details, but did say the audience will be treated to an epic battle between Schwarzenegger and Chan. A total of 690 specialists from eight countries worked on the film, which was shot in both Russia and China. Huge sets were created (21 all together) including an impressive model of the Tower of London in Beijing. According to the producers, the tower’s interiors even included details like 18th engravings, while more than 500 candles were required to light it up. The largest chroma key screen in the history of the Russian cinema was built (a green screen used to project animated backgrounds and effects) at the Mosfilm studio in Moscow. To create a realistic forest scene with snow, living trees were placed in the studio and covered in special fake snow from France. Russian cinematographers and producers hope The Mystery of Dragon Seal: Journey to China will make an impact on the Asian market. The Russian and Chinese investors split the eye watering $49 million budget down the middle. According to Petrukhin, hopes are high that the film will rake in big profits in China. Russia’s cinema market is considerably smaller, so the financial success of the movie hinges on the Chinese interest. The film has not escaped the attention of some high-ranking officials, with President Xi Jinping personally supporting the release of The Mystery of Dragon Seal: Journey to China during a speech at the One belt, One Road Forum. The third movie in the Viy series is already in the pipeline and likely to be realised in 2019, Petrukhin told RIA Novosti. Journey to India: On the Threshold of Immortality will again be produced by Russia and China, but India will also back the project. Several scenes have already been filmed, Petrukhin said. The grandson of the famous Indian actor Raj Kapoor, and one of the highest paid actors in Bollywood, Ranbir Kapoor, will both play leading roles in the third Viy film. The so-called “King of Bollywood” Shah Rukh Khan will also participate in the project both as an actor and producer. The details of the plot are not known at the moment.